Organizations that are Omnichannel and have a strong presence on the web, mobile, social, kiosk, etc., have access to lot of vital insights on their customers’ behaviour as they leave digital footprints behind. Clickstream logs are composed of thousands, millions or even billions of bytes that tell the story of views, add to carts, checkouts, likes and even bounces at every point in the customers’ online journey. The challenge lies however, in ingesting and transforming the clickstream data in swift timeframe to extract key metrics/ KPIs and leverage them for further analysis. 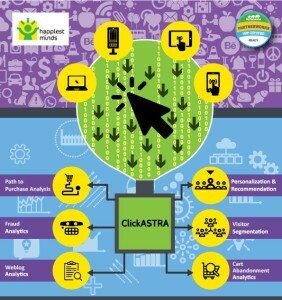 “ClickASTRA, substantially reduces the development efforts and implementation time to build clickstream data warehouse and provide generic metrics out-of-the-box. Apart from reducing the time, the solution also helps in understanding consumer’s journey, their path to purchase and the 360 degrees of interactions across various channels. This opens a range of business benefits to the organization from enhancing customer experience to increased sales” said Puneet Jetli, CEO, Digital Transformation and Enterprise Solutions (DT&ES) Business, Happiest Minds Technologies. “The key advantage of this solution is that it can handle any broken records, dynamic schema changes and more importantly reduce the development time from months to weeks, thus making big data adoption very fast” said Sethuraman Janardhanan, PhD, Practice Leader, Big Data and Analytics, Happiest Minds Technologies. ClickASTRA is the smartest and fastest way for enterprises to build several big data applications including recommendation engine, visitor segmentation & lifetime value, cart abandonment analytics, path to purchase analysis, fraud and weblog analytics. It is applicable in all omnichannel industries such as Retail, Travel & Hospitality, Media & Entertainment and Banking & Insurance. Recently, Happiest Minds Analytics solutions ‘ClickASTRA’ and ‘Personalization & Recommendation Engine’ have won awards “Best Analytics service in Social & Web Analytics” and “Best Analytics service in Marketing Analytics” respectively at the Big Data, Analytics & Insights Summit. This is yet another recognition showcasing Happiest Minds’ specialization in disruptive technologies. Happiest Minds enables Digital Transformation for enterprises and technology providers by delivering seamless customer experience, business efficiency and actionable insights through an integrated set of disruptive technologies: big data analytics, internet of things, mobility, cloud, security, unified communications, etc. Happiest Minds offers domain centric solutions applying skills, IPs and functional expertise in IT Services, Product Engineering, Infrastructure Management and Security. These services have applicability across industry sectors such as retail, consumer packaged goods, e-commerce, banking, insurance, hi-tech, engineering R&D, manufacturing, automotive and travel/transportation/hospitality.